Puckhead's Thoughts: "It Was Better"
A game of firsts. Alex Ovechkin's first goal of the season, head coach Adam Oates' first win as Caps' bench boss, John Erskine's first goal since May 4, 2011 (in came in the playoffs against Tampa), and it was the Washington Capitals first win of the 2012-2013 season. The Caps improve to 1-3-1 with a 3-2 regulation win over the Buffalo Sabres. "Today I thought we played a pretty complete game," said Jason Chimera of the win. "Neuvy played really well for us; he made some big saves for us. The power play got us one, which is huge"
The Buffalo Sabres would start the scoring off with a neutral zone turnover that made the Verizon Center faithful cringe. John Carlson, who has had a rough start to his season, coughed the puck up in just on the other side of the Caps defensive blue line. Drew Stafford picked up the loose puck, found a break Steve Ott on the wing who found the trailing Tyler Ennis breaking down the middle. A juke move that put Michal Neuvirth on his heals and the Sabres had the 1-0 lead. But the Capitals didn't fold, or look exasperated following the Sabres goal. They stuck to their guns and rifled away three straight goals over three periods. Joel Ward scored his third of the season when Jason Chimera took a sharp angle shot at the goal line, the puck hit the net and skittered to the front to a waiting Ward. Big Erskine scored his goal by making a nice move on the blue line to avoid the shot blocker, his wrister skipped off of a Sabres defender and slipped past the Sabres' net minder Ryan Miller. Ovechkin scored on the power play. His first of the year was a pretty one timer from a Mike Green feed. "He obviously could have had a couple in the first, and had a chance in the second," Oates said of Ovechkin's scoring chances. "He scored a big goal for us, and then could have had an empty netter. So I hope he would look at it like 'yeah, I had a lot of good chances.'" It was a much better overall game for the Capitals this season. Some signs the new Oates system is starting to take shape are becoming more apparent. Players are better recognizing where their teammates are and the players seem to be finding their legs. It also helped that the Sabres were with out there top scorer Thomas Vanek who did not play. The Capitals special teams turned the corner this afternoon. On the penalty kill, the Caps did a much better job picking up the right assignments. They also helped their cause by not taking penalties. The Sabres were 0-2 with the extra man. "It was better," Oates said of the PK. "I think we’ve had a couple of tough bounces, 5-on-3 goals are different. Our rebounds [were] bouncing over guys’ sticks whereas today they hit our guys’ sticks and we got a clear out of it." While on the power play, the Capitals finally found a way to get Ovechkin the puck. After going 0-2 themselves, they had a chance on the power play in the third to find that off wing one timer. Green found him, and Ovi put it away. A big goal which would become the game winner. Neuvirth is playing like he wants that number one job. And at the moment, there is no sign of him relinquishing that spot. Neuvy was dynamite today, making some solid saves, cutting down on rebounds and picking shots off with this glove. He made probably the save of the game early in the third period. The Caps were clinging to a 2-1 lead when a turn over led to a series of break downs in the defensive zone. Tyler Myers made a nifty pass from behind the net to an open Mikhail Grigorenko. The rookie tried to pull it around Neuvirth, but the goaltender flashed his right pad out in time and made the spectacular save. While this is a great win for the Capitals, they now hit the road for Tuesday and Thursday night games. There are still some problem areas to clean up, like the sometime sloppy play in the neutral zone and better overal passing needs to improve. The Capitals are 9-0-0 when Erskine scores in regular season play. Marcus Johansson, Tom Poti and Roman Hamrlik were the healthy scratches for this afternoon's game. Poti and Hamrlik are sitting out their second straight game. 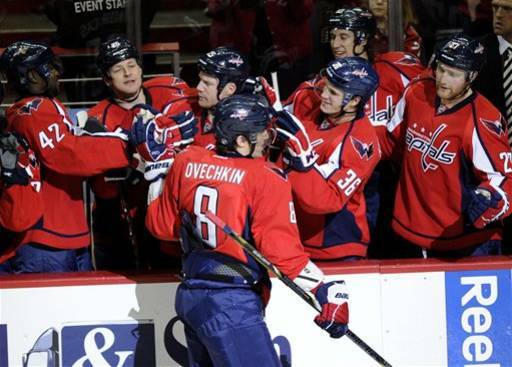 It was the 56th career game winning goal for Ovechkin.